A new jobs report shows software engineers with blockchain skills are in higher demand than at anytime in the past and the number of positions has grown more than five-fold in the past year. There's been a 517% increase in demand for software engineers with blockchain development skills in the past year, according to a new report from job search site Hired. 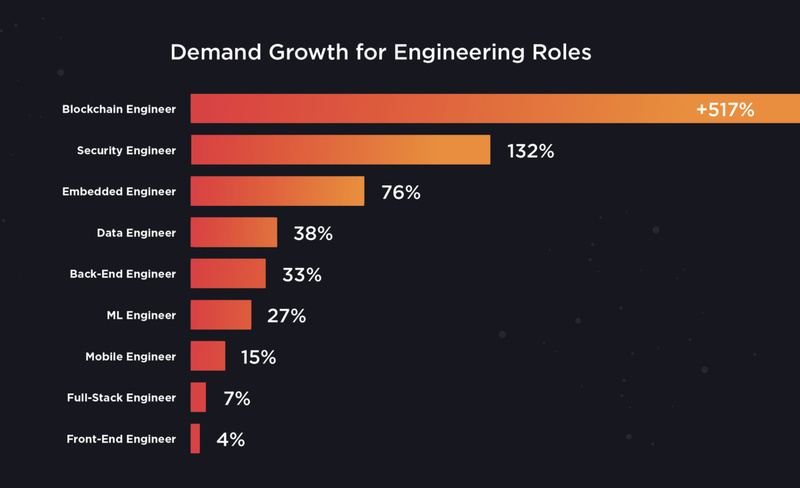 In its first-ever analysis of only software engineering jobs, Hired found blockchain development skills ranked in the top three job openings in almost every global region. Blockchain skills were followed by security engineers and embedded engineers, which saw 132% and 76% year-over-year growth, respectively. Mehul Patel, CEO of Hired, said the growth in demand for blockchain skills has gone "through the roof" and tops anything he's ever seen. "It's staggering growth," Patel said. San Francisco-based Hired culled its data from the resumes of more than 100,000 job seekers and job postings from more than 10,000 companies that use the website. 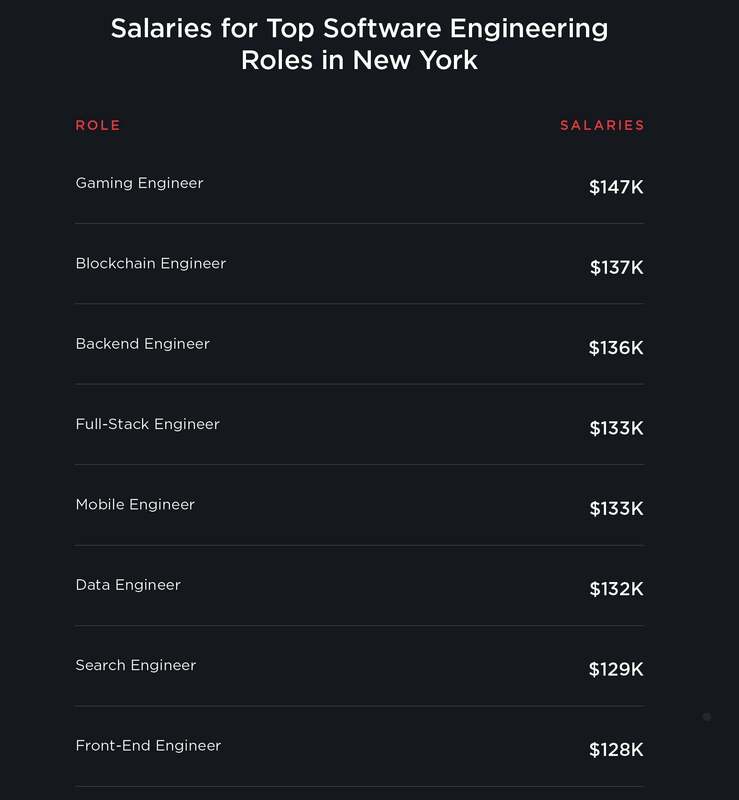 Salaries for software developers with blockchain skills are as high as $157,000 in the U.S., according to the report. Outside the U.S., salaries drop significantly, but that is to be expected as pay for software engineers in general is lower in other regions, Patel said. In London, for example, software engineers with blockchain development skills earn as much as $90,000; in Toronto they earn up to $75,000; and in Paris, $67,000, according to Hired's report. Hired's data is not far off that of other recent job reports. For example, job market research firm Burning Glass Technologies in December reported that blockchain developer job openings had grown 316% in the past year – creating 12,006 job openings in the U.S. alone. 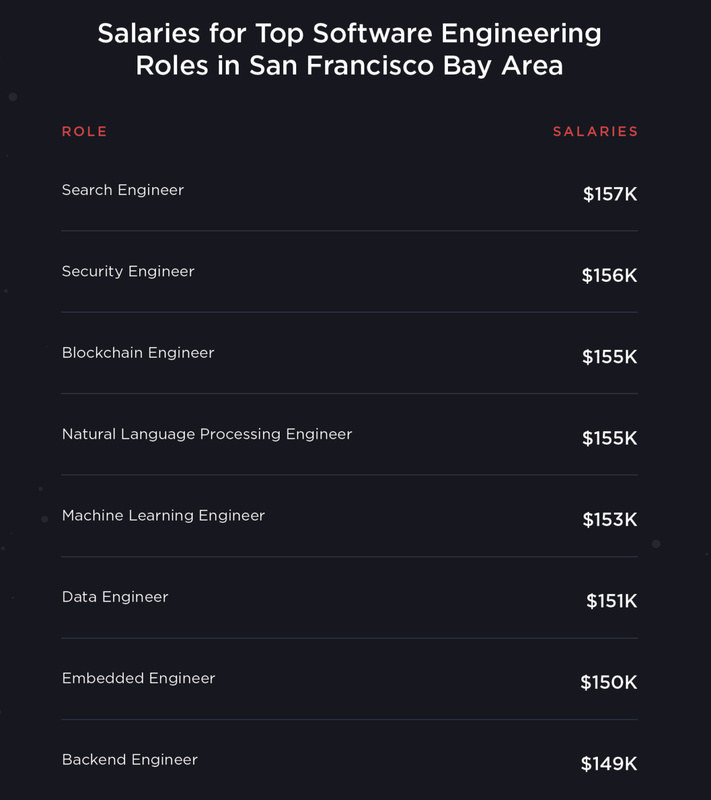 The median advertised salary for software developers requiring blockchain skills in the U.S. was $125,000, according to Burning Glass Technologies. "As demand increases, so do salaries," according to the Hired report. Also, in December, LinkedIn revealed its top five emerging careers and found blockchain developer was number one. Job listings for those who can create blockchain ledgers had grown 33-fold in a year, according to LinkedIn's 2018 U.S. Emerging Jobs Report. In distant second place were machine learning engineers, positions that saw a 12-fold increase during the same period. Another problem affecting the mismatch between the need for blockchain developers and a lack of available workers is the difficulty in finding places that offer training, Patel said. In general, one in five software engineers is self-taught, according to Hired's data. "I think generally we are seeing less than half of engineers we looked at had a B.S. degree and one fifth of them had gone through a year and a half of school. So one-third of our engineering base are self-taught or taught through non-traditional means," Patel said. Almost two-thirds of the software engineering roles on Hired's platform didn't have blockchain in the title, but did list it as a skill. "So, I think the title itself is not out there yet, but folks are definitely looking for the skills," Patel said. While still relatively rare, blockchain training programs have begun to pop up and are now being offered by some of the nation's leading universities, including Princeton, Stanford, UC Berkeley, and MIT. While blockchain may be a relatively new technology in terms of enterprise deployments, Patel said he's confident demand will continue to be strong for years to come as businesses begin implementing "their countless use cases" Those uses involve everything from digital identity and smart contracts to workforce management and distributed data storage. "I think there's a deep feeling here that blockchain is the next wave of technology innovation that will underpin almost every industry one way or another – sort of like the first wave of the internet in the 1990s," Patel said. "So no, I don't think this is a temporary thing."